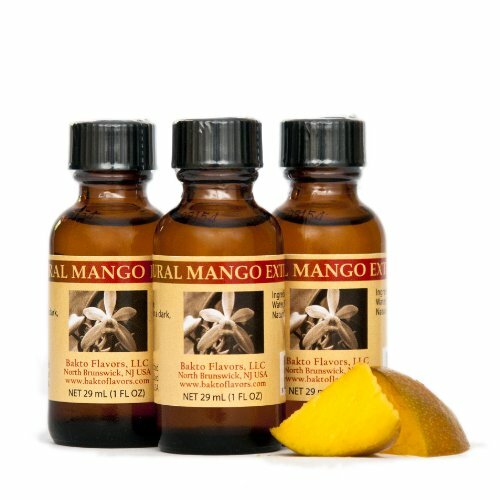 One of our most popular Natural Extracts, Natural Mango Extract is an excellent addition to your baking needs. Great in ice cream, whipped cream, and pudding. Usage: ½-1 teaspoons in your favorite cakes, blended with yogurt, added to cream, pudding, coffee, tea, water, ice cream, fruit salad, salad dressing and many more. It is one of Daphna's favorite flavors. Regulatory Information: Food grade, Natural, Kosher. List of Ingredients: Alcohol, Water, Propylene Glycol, Natural Flavors. Storage: Store in tightly closed container at a cool temperature. Avoid prolonged exposure to light, heat and air. Shelf life is 2 year. Comments: No sugar, corn syrup, or coloring added. Gluten free, Produced in the USA. Add 1/2 to 1 tsp to your cake to create a delicious fresh Mango flavor. Add to fruit pies, salad dressing, creams, ice cream. Use for marinades, fish. chicken, or meat. Make your own natural drinks with a few drops of extract, seltzer, and the sweetener of your choice. It is one of Daphna's favorite flavors.